My lips may have just met their soul mate. They've been trying for years to find the perfect gloss -- one that slicks on effortlessly, stays put for hours without looking matte or dry, and offers gorgeous color. And while many have done the job brilliantly, my lips have always been left wanting something more ... until now. 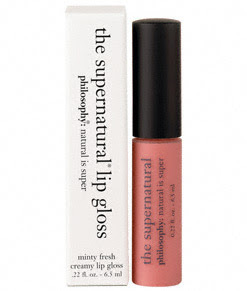 Philosophy's The Supernatural Lip Gloss in Soft Peach has done the job brilliantly. The second the gloss touched my lips, they knew they were in the presence of greatness. It glided on with miraculous ease, covering them with just the right amount of a barely there peachy hue that was so flattering, it instantly added that little special something to my otherwise makeup-free face. Far from being sticky, my lips felt as though they were coated in chapstick that left them supple, smooth, and oh-so-moisturized and creamy. But the unexpected surprise was the mint that the gloss exuded, which was alluringly fresh and flavorful. It's possible that my lips have met the love of their life.